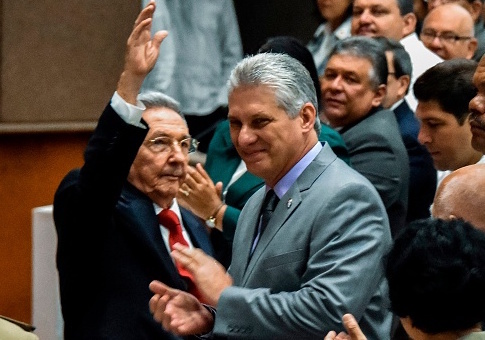 The Associated Press tweeted Thursday that Miguel Diaz-Canal was "elected" the president of Cuba, a nation notorious for its lack of free and fair elections. "BREAKING: Miguel Diaz-Canel elected president of Cuba," the AP tweeted. BREAKING: Miguel Diaz-Canel elected president of Cuba. The initial AP wire likewise read simply, "Miguel Diaz-Canel elected president of Cuba." Diaz-Canel, previously the first vice president of the country's Council of State and Council of Ministers, was "elected" by the Cuban National Assembly, compromised entirely of members of the Communist Party of Cuba whose candidacy must by certified by the state. He was the only candidate on the ballot, having been hand-picked by outgoing president Raul Castro to be his successor. Twitter users, given the lack of a free election in Cuba, mocked or denounced the AP's use of the term "elected." This entry was posted in Politics and tagged Associated Press, Cuba. Bookmark the permalink.